A small family home will inevitably feel a little chaotic at times. But there are a few key features that can help keep family life humming along with relative ease. These features might involve the basic layout of the home, furniture elements and architectural features. Everything needs to be very functional, and the smart use of space is crucial. Anything that makes your life easier is a very good thing! So today, we present 10 features every small family home needs. Not every point will apply to your home, but there's plenty of inspiration here that can be adapted to a whole range of small living spaces. Clutter is an obvious problem in many homes and this is of course compounded when you have lots of people living in a small home. 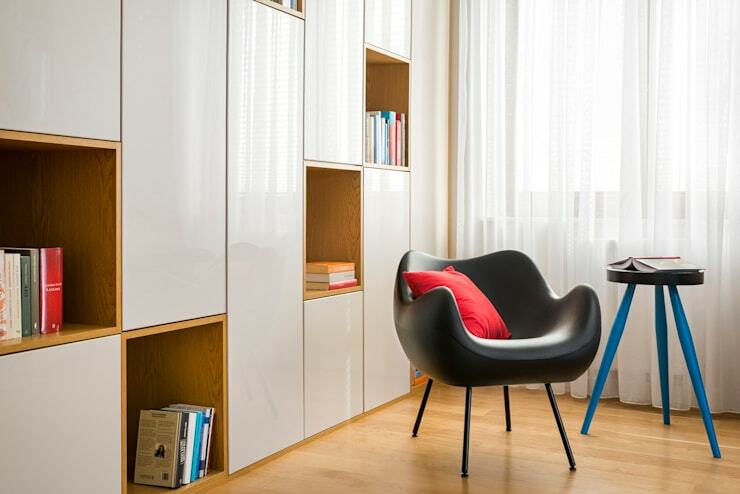 Built-in cupboards that run right to the edges of the room are a really good way to add storage space in a small home. They blend into the walls and don't take up a whole lot of visual weight. They also provide good opportunities for closed and open storage units. This is a good thing when you have lots of trinkets you may want to keep out of reach. Round tables are perfect for a small home. They take up less space than square or rectangular tables and this is a good thing in a small living space. A round table also helps avoid those bumps and knocks that are a real problem when moving throughout a small home. This is particularly relevant for those with small children. A home with lots of occupants of varying ages will suffer a lot of wear and tear. It's best to use sturdy materials for the floors and furniture in the home. A kitchen table that can easily be wiped down is a must. Wooden furniture will tolerate lots of knocks without looking worn down either. Glass is a definite no-no and highly polished surfaces will show up the slightest fingerprints and marks. Despite all this, there will be inevitable damage and just perhaps a few children's scribbles on the walls. Some parents even love the nicks and dents in an old wooden dining table. They see it as a living symbol of family life! 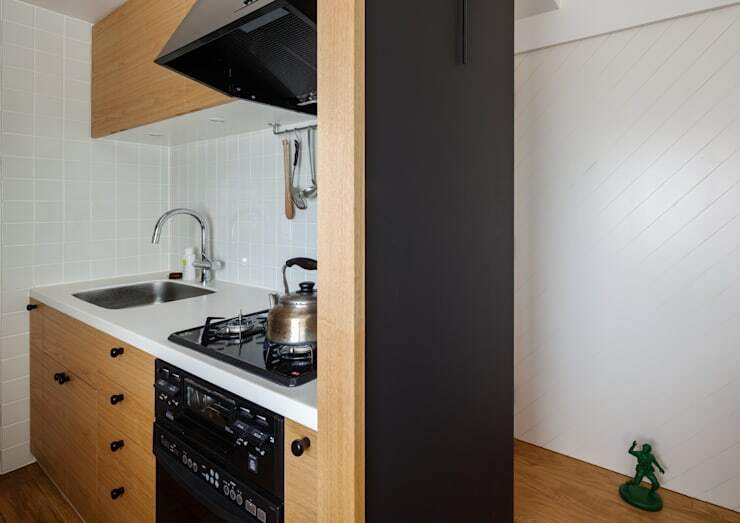 We love this little kitchen because it's got that blackboard panel on the right. A blackboard is a good, low-tech way to create a little communication hub in the home. Those with small children will appreciate that it can be used to occupy small children with drawing activities while parents are cooking. For older children, it may become a key place to note social events and shopping lists. The laundry area in a family home is a busy hub. Those with small homes may not have a dedicated laundry, so the wall space should be put to good use. 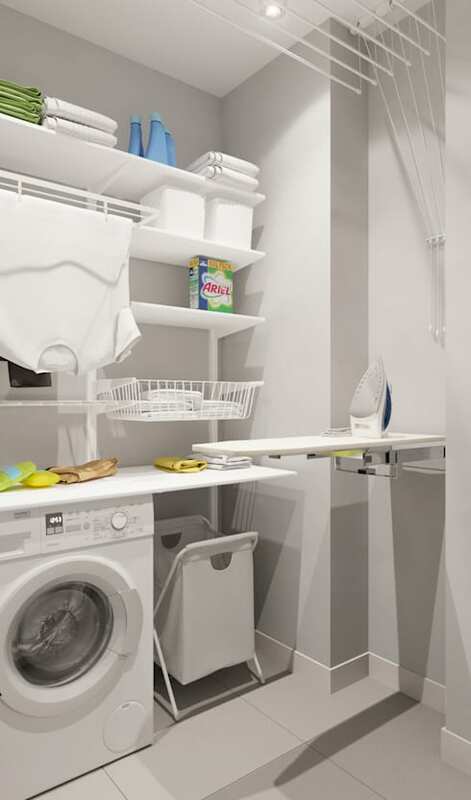 Note how this laundry area has a fold out ironing table that can be easily pulled out when needed. It also has a couple of high, mounted drying racks and lots of good open storage shelves. Finally, space may be precious in a small home, but it's always a good idea to set aside a corner for a dedicated laundry hamper. Flexible seating options are an absolute must weather you have teenagers or younger children. Bench style seating is often really good because it can tolerate more little people when guests come to visit. A bench seat can also be pushed under the table when not in use which saves on floor space. Standard dining chairs without armrests are another good option in this sense. Finally, consider a couple of beanbags for the living room. They suit every body size and add a fun element to hanging out with family. The ultimate design for a small family home includes a combined kitchen, dining and living room. 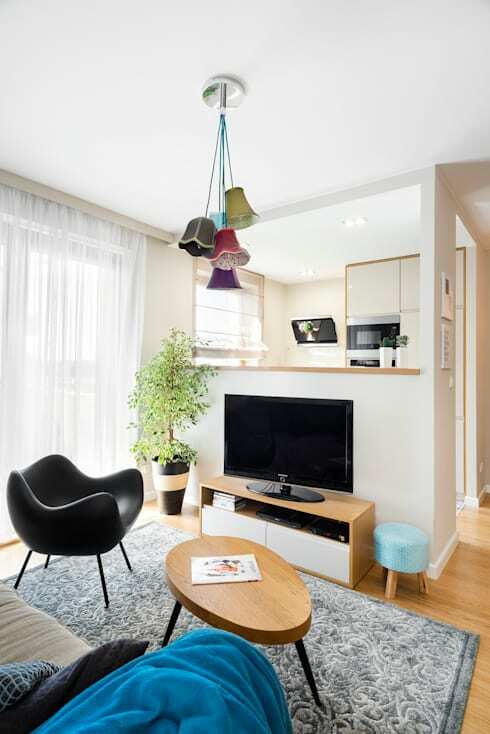 This offers all the well-known benefits of making a small home feel spacious. But it also has a few more benefits for the family. 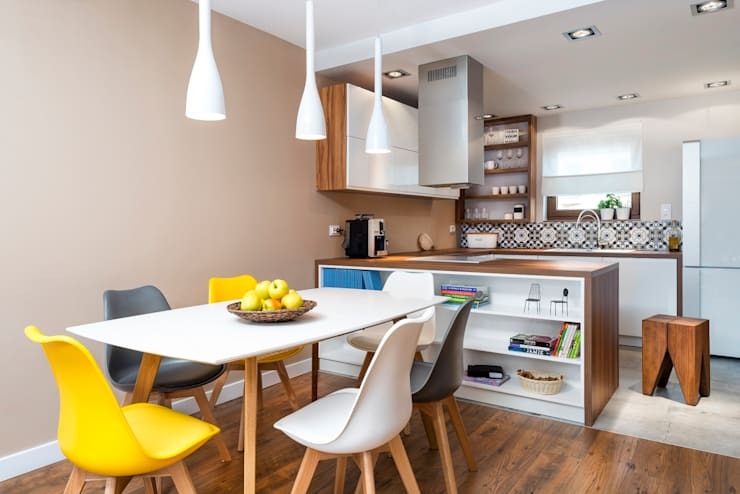 This kind of layout means that parents cooking in the kitchen can easily keep an eye on small children playing in the living area or studying at the dining table. It's also a must if you want to monitor your child's television watching habits. Often it's not quite enough to have a combined kitchen and living room. It really helps to have a benchtop that faces outwards towards these living areas. This will naturally help the family engage with each other in a more natural way. After all, no parent wants to slave away in the kitchen feeling isolated. In our busy modern lives it's important to connect with our loved ones during our daily routines. 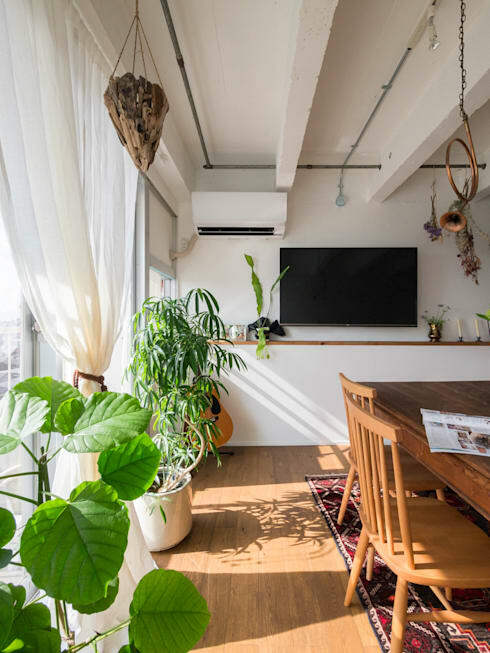 It's easy for both adults and children to get disconnected from the natural world when living in a small family home that may have no garden or just a small outdoor space. Green plants are a valuable way for children to learn to take responsibility for living things. They are also a good tool to help develop small children's respect and understanding of the natural world. For parents, an indoor garden will add a little much needed serenity to the home. It could even do double duty as a herb garden as well! A bathtub may seem a little superfluous in a small family home. But as you can see here, a free-standing tub can easily be pushed up against the wall. 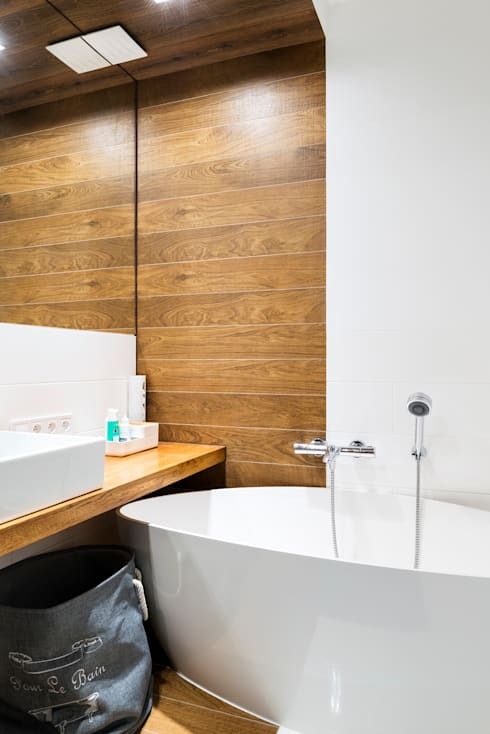 If you absolutely don't have the space or inclination for a bathtub, get a shower room in which you can fit a temporary small tub. It is essential for very small children and for tackling the tricky job of washing pets. 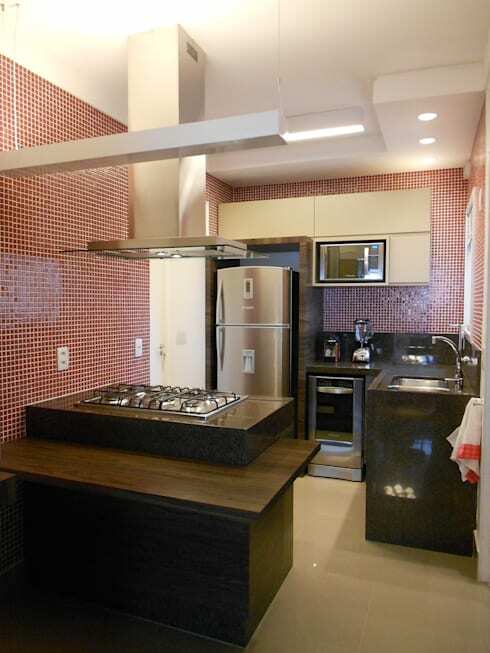 Now let's check out how some of these elements come together in The perfect apartment in 70sqm. 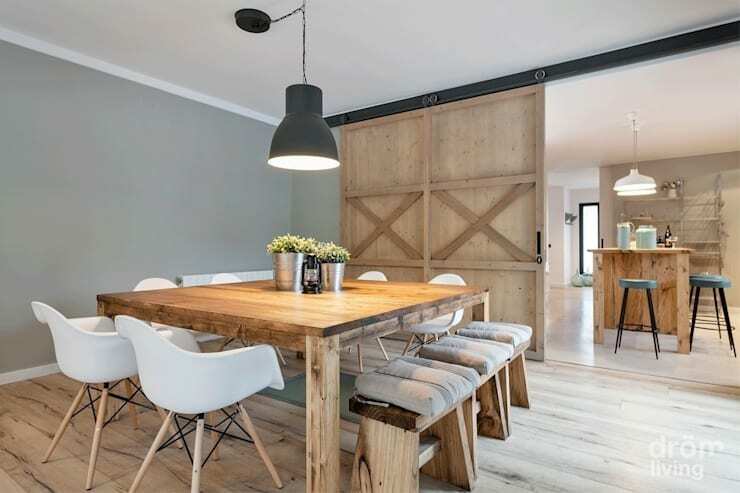 Which of these features might suit your family home?